Yesterday, I chronicled our journey through the body. Along the way, I highlighted some pretty gross photographs that I took. Becoming a parent has changed my life in many ones. One of the biggest surprises was how my idea of what constitutes “gross” has shifted. Back before we knew that B was pregnant for the first time, we did the “test the pee, see if you’re pregnant” test. This particular test required B to pee in a cup and then hold the stick in the pee for a minute. Since B had the job of actually peeing in the cup, it became my assigned task to hold the stick in the pee-cup. Standing there, with a cup of urine in my hands, I felt wave after wave of nausea hit me. The smell, sight and just plain idea of holding someone else’s pee make my stomach (and a few other internal organs) turn. Luckily, I didn’t succumb to the nausea. Even better, the test came out positive. Fast forward a few years. Did the idea of someone else’s pee in my hands disgust me? Not at all. In fact, I was quite comfortable relaying stories of the Day of the Seven Diaper Diaper Change (where NHL filled up diaper after diaper as quickly as we could change them) or of the Great Projective Pooping Incident (where his poop shot out 4 feet and then covered a span of rug stretching another 4 feet, timed right when we needed to head out to see a house). I could even discuss these subjects in the middle of lunch (and be amused at the reactions of the non-parents within earshot). 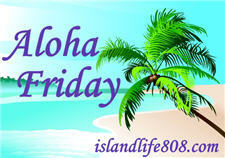 My Aloha Friday question for today is: Has being a parent changed your definition of what “gross” is? Bodily fluids gross me out a lot less now. Before the boys, I would run from the sight/scent/sound of puke. Now I can cope a little better. Yes…or at least its toughened me up to gross a little. Once you’ve turned around to see your one-minute-ago perfectly clean baby sitting happily covered with his own feces and eating a cracker, you’re less likely to be shocked by lesser messes. Though my boy’s bathroom still disgusts me when I clean it every day, and some of the things they do just wig me out sometimes. YES!! I definitely have a stronger stomache now!! I’m not a father yet but i’m visiting my nephew often and i can say that now i have a much stronger stomach now. So, my answer is Yes!